For those of you who want to really understand the absolute terrifying magnitude of this issue, we STRONGLY urge you to download and read the FREE e-book, by doctor Mark Sircus. Be warned!! This material is NOT for the faint of heart. This IN-DEPTH expose will chill you to the bone. We're not joking. We are are under a full out attack by our own government and medical profession. Attention Parents: Is Your Child at Risk for Autism, Asthma, Allergies, Diabetes or even Cancer? Big Pharma Has Pulled the Wool Over Your Eyes and Lied to You about Vaccines. . .Get the Complete Story Before You Make Your Child an Unwitting Lab Rat! "This book dispels the myths and blatant lies that the public is told by their pediatricians and community leaders, as well as the propaganda, politics and money in U.S. vaccine policy. . .an absolute must for any parent." Do you have doubts whether vaccines are really protecting your child from harmful illness or disease? Do you worry whether your child could be autistic, is developing asthma or allergies, or worse, could come down with a fatal childhood disease? Well then, some of what you're about to read may come as a shock. It did for me when I first began to research vaccines and their effect on the body over a decade ago. Thousands of hours of digging into the medical literature and months of checking and rechecking the facts resulted in a manuscript that I was reluctant to publish. To be honest, I feared I was putting my career in jeopardy by speaking out. Much of what I discovered was in conflict with the way most of us are taught to care for our children. Let's face it — virtually every parent agrees to have their newborn child vaccinated and believes it is the right thing to do. That child then goes on to receive numerous vaccinations year after year up through their teens. All the while you, the parent, continue to think you're doing the right thing. Well. . .turns out reality is not what it seems. While it can be difficult to go against the grain of what your doctors, the government, and the drug companies tell you is best for your child. . .
What you'll soon see when you peek behind the curtain of the multi-billion dollar drug and vaccine cartels should scare the heck out of you. . .because your child is being put in harm's way more than you could ever know. And more than you are being told. Whether or not you choose to vaccinate is a decision only you can make — not a decision I or anyone else can make for you. Sadly, it's not likely you can turn to your pediatrician for help with this decision either. You see, many doctors have staked their reputations and their financial well-being on the assumed safety and effectiveness of vaccines. They are bound by their profession to promote vaccinations and that is what they do. That being said, what I can do is offer you access to my years of research and investigation, enabling you to make a more informed decision — one that can give you peace of mind in knowing that your child is going to be safe. The harsh truth you're about to discover is that vaccination is big business and big money for doctors, for the drug companies and for the government. The harsh truth is that vaccines are by no means proven as safe as you are being led to believe. Some would go so far as to say it's an outright assault on children and the future of the human race. Those would be top scientists in the field of human genetics. But how smart is it for parents to get all their information about vaccines only from those whose business it is to sell them? You deserve to know the facts. You deserve to have access to the information being put forth by doctors, scientists, and researchers all over the world who are speaking out against vaccination — because the facts can no longer be denied. The bottom line is that we're talking about the safety of your child and the legacy they'll carry on in your name. . .You deserve to know the facts. "The medical authorities keep lying. Vaccination has been a disaster on the immune system. It actually causes a lot of illnesses. We are actually changing our genetic code through vaccination...100 years from now we will know that the biggest crime against humanity was vaccines." to reject all inoculations for your child." "There is no convincing scientific evidence that mass inoculations can be credited with eliminating any childhood disease. If immunizations were responsible for the disappearance of these diseases in the U.S., one must ask why they disappeared simultaneously in Europe, where mass immunizations did not take place." All the more reason for you to have access to the facts - for your child's safety and welfare and for your peace of mind as well. Is Big Pharma Preying on You? That might be a shocking new way for you to view things, but when you read the history of vaccines and understand the financial gain that is at stake, you'll quickly see it's not too much of a stretch to see the image of the drug industry as an enormous parasite, feeding off the endless government funding for vaccines. In a moment I'll share some of what you can expect to discover when you purchase and read the newest edition of my book, The Sanctity of Human Blood, and why it's so vital that you get the facts. The history of vaccines, the nature of vaccines, the dangers of vaccines — it's all there. Remarkably, vaccination has never actually been clinically proven to be effective in preventing disease! I find this to be one of the most shocking discoveries of all, and so should you. The double-blind, placebo-controlled study, which is the medical community's gold standard, has never been used to compare vaccinated and unvaccinated individuals. Vaccines remain scientifically unproven! Here's the thing — while health authorities credit vaccines for reducing disease and send the message that vaccines are safe, the data says otherwise. In fact, the assumptions made by these health authorities are directly contradicted by government statistics, published medical studies and the opinions of credible and highly respected research scientists all over the world. Ironically, reports coming out of the Food and Drug Administration (FDA) and the Center for Disease Control (CDC) are finding the same contradictions! So what is this hoax being thrust upon an unsuspecting population — a population that includes you and your children, your neighbor's children and children all over the world? In a word, Big Pharma. Who Really Cares about Your Child? It is the vaccine manufacturers — Big Pharma — who are behind pretty much everything you have ever been told about the safety of vaccines. As Dr. Samuel Katz, developer of the measles vaccine states, "Government doesn't fund clinical studies of vaccines. Industry does." Big Pharma knows where their bread is buttered! Consider this - according to the World Health Organization's 2006 figures, there are 43 million injections given per day and 16 billion injections given per year to children around the globe. The current number of vaccinations your child will receive by the time they are 18 years old is an astounding 68! And more vaccinations are on their way. That my friend is one very large cash cow, expected to be a $25 billion dollar industry by the year 2010. Do you really think Big Pharma cares that your child is participating in untested experimental trials with some of the most dangerous biological substances ever devised? Because this is essentially what's being injected into the formative circulatory system of your child. A false dependency on the modern medical establishment for health and well-being gets started with your baby's first breath. And your children are put at risk to dangerous and life-threatening diseases before they utter their first words and take their first steps. "Immunizations, including those practiced on babies, not only did not prevent any infectious diseases; they caused more suffering and more deaths than has any other human activity in the entire history of medical intervention." All I can say is, shame on them! I decided early on that I would take a stand for the truth regarding vaccines, no matter what the cost. I was determined to write a book that was fully referenced with the facts and figures, so that as a parent you could make an informed decision. In the world of vaccines today, the fox is guarding the henhouse! It's similar to trusting cigarette companies when they talk about the safety of cigarettes, only even worse. Drug companies support medical journals with their advertising. Vaccine advisory committee members have financial ties to the vaccine manufacturers and regularly waive their conflicts of interest. These same companies even donate money to the American Academy of Pediatrics. What's more, Congress passed a law covering the liability of these companies so they are pretty much free to do as they please. In other words, if your child dies, you can't sue the vaccine company. Announcing the updated 12th edition of. . . The Sanctity of Human Blood is written for everyone concerned about the health and well-being of their children — and of themselves. It's for parents, educators, those in the medical profession, midwives, nurses, those working in government and practitioners of alternative medicine as well. If you are not currently a parent but plan to have a child some day, you must read this book. If you are not currently a parent but know someone who is, you must give them this book! Consider for a moment just how frighteningly serious the state of affairs is for children in the United States. . .and then ask yourself, do you want your child or a child you know to become one of these statistics. . . This is just the tip of the iceberg; conditions are compounding even as you are reading this letter. With dozens of vaccines in the developmental pipeline, and authorities arguing to increase the number of vaccinations your child should receive, the risks will only increase every year. You must educate yourself about these risks now. The Sanctity of Human Blood is 200+ pages of fully documented information along with 350 footnoted references that will open your eyes. There is a detailed history of vaccines and this latest edition has been updated to include the most recent vaccines released. It's written in an easy to understand language as well — not the "med-speak" found in medical journals. You'll come away understanding the big picture as well as the actual science behind the most common vaccines. You'll have what you need to make an informed decision about how you want to best care for your child. Here's a look at some of what's covered. . . The disturbing truth: why children are growing sicker, fatter and dumber year after year – Is this what you want for your child? The shocking composition of what’s really being injected into your child. Warning: this section of the book may not be suitable for those with weak stomachs, but it’s something you need to know! Think only your children are at risk? Think again. As of 2008, we adults are Big Pharma's newest target, with the CDC's new Adult Immunization Schedule of 74 vaccines! What is the Germ Theory and why does the medical establishment ignore the errors inherent in it? The implications for your child’s health are mind-boggling! Booster shots and the amazingly unjustified claims the medical industry makes about them – Even though they fly in the face of why your child is supposedly vaccinated in the first place! What is the viral load and why is it important? Your child’s health is more at risk than you’re being told! 3 types of adverse reactions to vaccines and why you especially need to be concerned about the 3rd one – And what does Xerox have to do with it? 12 deadly reactions to the DPT vaccine – Did you know that the three vaccines contained in this three-in-one injection were never tested together before it was brought to market? It’s an outrage! If that's not enough to make your hair stand on end and get your blood boiling, there's more. . . The marketing muscle and false advertising behind the MMR (measles-mumps-rubella) vaccine – If so many doctors are refusing to give it to their children, what is that telling you? Plus, there are another 12 adverse reactions that can result from this vaccine! According to the commissioner of the FDA, the number of adverse reactions to vaccines are being woefully underreported – Make sure you’re sitting down when you read what’s really happening because the truth is very scary! The blatant lies told by the National Institutes of Health regarding the Hepatitis A Vaccine – Do you think a billion dollars in annual revenue has anything to do with it? What the World Health Organization (WHO) says about measles – Could this be the nail in the coffin regarding the effectiveness of this vaccine? What are "toxoids" in vaccines and why are they being used on your child? And are you sure you want these poisonous substances injected into your child? What People are Saying about "The Sanctity of Human Blood"
"The most comprehensive book I have ever read over the past 25 years on this subject." "You are right about pure blood. . .that is the key." "Tim O'Shea is one of the few people writing on vaccines today who has the courage and dedication to tell it like it is, in detail." ". . .one of the most shocking yet thoroughly researched exposes on the vaccine industry. . . an issue that is vital to our children's health and future." "Keep going after the truth -- just make sure your bulletproof vest fits." "The book is 5 stars out of 5. . .The themes are logically sequenced and interwoven such that one hardly notices that that one chapter has passed, and the next has begun. . .The information is top-notch and invaluable. Should be required reading for expecting parents." "Life-changing information, thoroughly researched. Thank you so much for putting all the pieces together and shining the light of day on an immoral greed-driven industry." 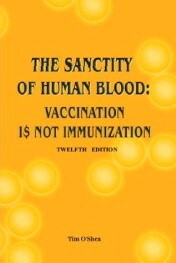 "The Sanctity of Human Blood is the most well documented analysis of the vaccination cult of modern medicine. Be informed of the dangers, lack of scientific proof of immunity, and other concerns of vaccines. As the best source for the public and professionals, I highly recommend The Sanctity of Human Blood." ". . .a careful collection of irrefutable facts. . .spent several days reading and re-reading it and it is fantastic!" "In his book Dr. O'Shea records the shameful history of what has been done by the drug companies and the institutions that are supposed to make sure they are honest. . .the role played by vaccinations over the past 100 years has been grossly exaggerated and the harm that this has done has been carefully hidden from the public view." "Your book is a great read. It removes any lingering doubts one may have about the innocence of those orthodox medical vampires. I admire your energy, intellect and courage, putting yourself out there on the line. . ."
"This book is the best source I have in my library about the history and the horrors of the vaccine industry. . .the three generations of wholesale poisoning that Dr. O'Shea reveals in this book. . .Thanks for doing the research for the rest of us." "Thank you for the valuable service you are providing. It must take a lot of courage and dedication to tell it like it is in face of the medical establishment with their arrogance and deep pockets. If there is anything I can do from the position of the clergy, please let me know. I believe this information is extremely vital and should be widely disseminated." "Friends of ours just had a baby at the local hospital and were offered a Hep-A shot for their newborn! A NEWBORN, imagine that. Even veterinarians won't vaccinate kittens and puppies as newborns. What is WRONG? What is wrong with doctors who would go along? Thank you again for your great service to humanity!" "I finished your book this morning. Simply the best and most accessible deconstruction on vaccines I've read, and I've read quite a few. You should be proud, as I am of you, your courage, and your work!" "Wow! The most current, best referenced presentation on vaccines I have ever seen. You have taken a very complex subject and organized it so that it can be comprehended by the average person." "Every new mother and father should have the opportunity to read The Sanctity of Human Blood before subjecting their children to mandatory vaccinations." Get the Complete Story Before You Vaccinate! Over the years of delivering seminars and presentations on the material you'll find in my book I would often have concerned parents come up to me and ask questions. Many had heard the horror stories, others were not sure whom they could trust. Nearly all expressed the fear of having their child become autistic, defective or neurologically damaged. No one wants to put their child in harm's way and the thought of seeing their child go from healthy to physically or mentally handicapped in a matter of months or years is too much to bear. Worse yet, there is a very real potential of seeing your child have a delayed reaction as many as 20 years later. The injection of 68 vaccines, 36 of which are administered before your child is 2 years old, is altering the human genome in ways no one can predict! The countless times I have heard parents expressing their fears and concerns, their being unprepared to deal with things like Autism, Attention Deficit Disorder, Asthma and even the alarming increase in behavioral challenges — has spurred me to keep updating this book. Now in its 12th edition, the updated version contains 350 references from medical studies, government reports and scientific research. All your questions and concerns are answered and addressed honestly and without hype. You and your child deserve to know all sides of the story and now you can. Make the decision to get informed and stay informed starting today! When it comes to safeguarding your child's health, you deserve to have access to all you need to make an informed choice. Not just the propaganda coming from those who stand most to gain from the 68 or more injections your child will receive by the time they leave the nest. The truth is that the effects of vaccines on the body of your child are not predictable and this is a big part of the problem. They occur in a random, haphazard and inconsistent fashion. Moreover still, loaded as they are with nightmarish toxic additives, vaccines are rightly considered immunosuppressive — which has little to do with providing your child an immunity from disease or improving their overall health. Pick up a copy of The Sanctity of Human Blood today and get the complete story. Take back control of the flow of information. Your child will be very glad you did. . . because the sanctity of their blood is the line in the sand that should not ever be crossed. To the health of your child and children everywhere. . .
P.S. The medical evidence regarding the risks of vaccinating your child is compelling and The Sanctity of Human Blood lays out this evidence in easy to understand terms. Stop relying solely on the media for information or those whose financial fortunes depend on you remaining content with half-truths. Get your copy of The Sanctity of Human Blood today. P.P.S. With Autism and other childhood diseases on the rise, it's vital that you consider all the facts regarding vaccines and their potential impact on your child's health. There is simply too much at risk not to have the whole story. Order your copy of The Sanctity of Human Blood today. Our thanks to Dr O'Shea for his extraordinary work. The ferocity with which your access to our Autism - An Inside Job webinar, scheduled for 09/11/13, has been blocked tells me all I need to know: the England Hypothesis is true. Vaccines are not only a scientific hoax, they are designed to damage and destroy minds to create docile, dependable drones for the Globalists. Now, on the eve of this webinar I will stop calling it a hypothesis and elevate it, thanks to the brutal suppression tactics of the Would Be Masters, to the England Theory. So how do you get to participate since your registration has been blocked? Simple. Forget about the registration page. It has been sabotaged. Just go to our Donation page here - before it is sabotaged, too, http://drrimatruthreports.com/action/donate/, and donate $19.97. I will make sure you get the attendance link tomorrow so that you can attend this webinar which THEY really, REALLY do not want you to do! What will you learn? Everything you need to know about who, what, when, where, how and why you and your children are being intentionally poisoned. Here is that link again: http://drrimatruthreports.com/action/donate/. Don't wait. I have no idea how long THEY will leave this link up. Disclaimer: The statements contained on these pages about vaccines and side effetcs have not been evaluated by the Food and Drug Administration. The information in this document is not to be used to replace the services or instructions of a physician or qualified health care practitioner. Vaccines and side effects.